Can you support large media groups? Yes. We originally built the platform specifically with large broadcasting groups in mind. We can handle any size, large or small, whether television, radio or newspaper (and more). Do groups have the ability to share content? Yes. Groups that decide to share content will see multiple accounts across the group in the Field59 manager. I manage a small group. Can we afford your services? Yes. We have pricing flexibility based on your unique needs. I'm concerned about being FCC compliant. What services do you offer to ensure compliance? We support and display the embedded close caption data that is already part of your broadcast signal, or you have the option to manually upload your sidecar captions into our system. Do you have HD video? Yes! HD video is becoming increasingly important when distributing video to OTT apps. Do you provide video content? No. But we can import content from other video content providers that you have the rights to. Do you provide a revenue share? No. We offer something better. 100% of the revenue earned from your videos is yours. Our organization doesn't have any live streaming equipment. What do we need? Will it be expensive? Live streaming doesn’t have to be an expensive undertaking if you are just starting out. Your staff can live stream immediately with their mobile phone. Read about other encoder options here. Do you really work with any CMS? Yes we do! At a very basic level, you can easily copy and paste embed codes for your videos, similar to YouTube. But we also have more advanced integrations, like we do with TownNews.com’s BLOX CMS. When publishing on that platform, you have the option to select videos that you’ve created in your account on Field59. Can we import our existing video archive? Yes! We have worked with other video providers to import videos created on other systems. You won’t lose any of your videos. Can I choose which solutions I want from what you offer? Yes. You don’t need to buy the full Field59 solutions package if it’s not right for you. You can choose only what you need. Also, you can easily use Field59 in addition to other third party services you already have or want. What's your experience in the news industry? We have 15 years of experience in the broadcast industry so we’re keenly aware of the news publishing workflow. During this time, we’ve built a video platform from the ground up specifically with broadcasters and newspapers in mind. Today we are proud to provide a tailored video publishing workflow for news creators and additional opportunities for revenue. Yes. We send video data to your existing Google Analytics account(s). Do you work with my ad server? We are integrated with DFP (Double-Click for Publishers). You’ll have the ability to target campaigns by category and keyword. Is it true I can share my live stream video simultaneously to my website, YouTube Live, Facebook Live and Twitter with Periscope? It is! 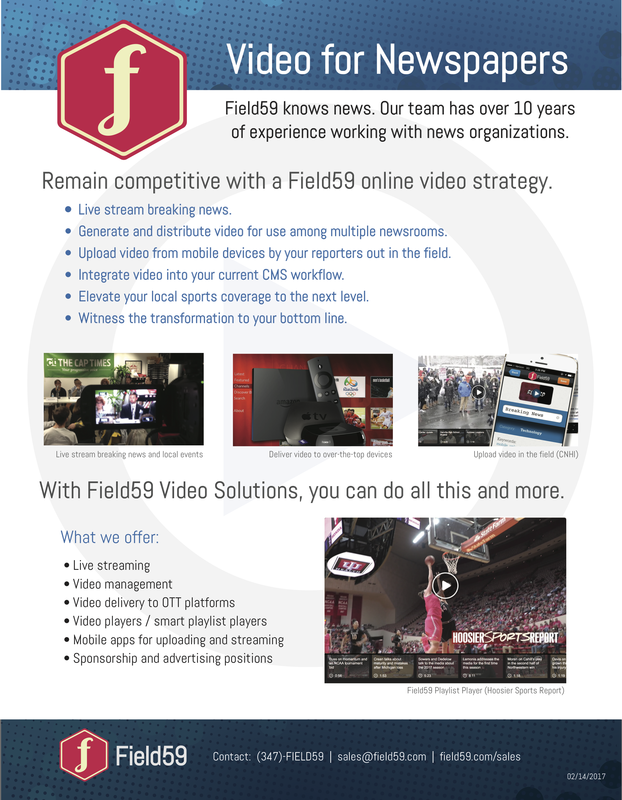 Learn more about Field59’s VideoLink.